Set 3365 - Space Moon Buggy. All 100% complete with instructions. Set 3178 - Sea Plane. Lego Star Wars 7673 Clone Wars Magna Guard Starfighter (2008) Over 400 Pieces. Condition is Used. In excellent clean condition no dust or display marks no instructions or Minifigures I built using the lego pdf instructions online just search “lego 7673 instructions” awesome model Dispatched with Royal Mail 2nd Class. Lego 6544 - Complete with instructions. UP FOR SALE IS 10. 2 x Genuine Lego Crater Raised Baseplates in good clean used condition - no cracks or yellowing. Size = 32 lego studs x 32 lego studs. Lego Star Wars 8093 Plo Kloon's Jedi Starfighter - complete set with instruction manual in very good condition. Reason for sale is a familiar one to many - our two boys are growing up and now have other (expensive!). Series Blacktron ll - ALLIED AVENGER Spacecraft Minifig. Condition: The set is inVERY GOOD condition - complete, clean wit instructions - slight wear from use/storage. Set No:6887. This is an amazing Lego set from Star Wars. The set is in excellent condition having only been built once and then put on display. Happy for collection in person from Lothersdale. Printed Pieces/Tiles/Bricks/Parts including Harry Potter Snake, Ninjago, Star Wars - from Various Sets. LEGO JOB LOT - 42 Mixed Pieces. 1 x Used lot of 24 2016 Lego Star Wars Advent Calendar models (as in picture). LEGO Star Wars Landspeeder (7110). COMPLETE SET W/ INSTRUCTIONS. The blue hinge is missing a tooth but works fine. Custom Built Lego Starwars Type Space Cruiser. All 100% genuine Lego and built with stand plus adjustable cockpit, tilting wings and weapons in excellent condition. Combined postage available. May come fully or partially dissasembled for you to construct. (56 PARTS, 1 MINIFIG - sp033 M:Tron with Airtanks). Sets: Space: M:Tron THIS LOT CONSISTS OF A LEGO SET 6877-1 Vector Detector AS PER TITLE, RELEASED IN THE YEAR 1990. THE PIECES MAY HAVE SCRATCHES, TEETH MARKS, SLIGHT DISCOLORATION OR NOT BE AS SHINY AS THEY ONCE WERE BUT, UNLESS OTHERWISE STATED THEY WILL NOT BE BROKEN AND THE PIECES WILL STILL FIT TOGETHER. THIS LOT CONSISTS OF A LEGO SET 9496-1 Desert Skiff AS PER TITLE. Sets: Star Wars: Star Wars Episode 4/5/6 AS THE MAJORITY OF OUR LEGO IS PRE-OWNED, OUR LEGO GRADING SYSTEM IS THEY MAY HAVE SCRATCHES, TEETH MARKS, SLIGHT DISCOLORATION OR NOT BE AS SHINY AS THEY ONCE WERE, BUT UNLESS OTHERWISE STATED THEY WILL NOT BE BROKEN AND THE PIECES WILL STILL FIT TOGETHER. As pictured, good used played with condition. Lego Star Wars Magna Guard Starfighter From the Clone Wars Series, sold in 2008. A complicated build, over 400 pieces, quite detailed, with an opening cockpit both front and rear, and missiles which can be fired. No figures, no instructions and no box. Set is pretty near complete, just a couple of very minor substitutions which are hardly noticeable. A Great Star Wars Space ship to add to any collection. From a smoke free and pet free home. CITY: SPACE PORT. 100% COMPLETEWITH INSTRUCTIONS. All pieces have been accounted for and everything is in good used condition. Lego 7141 - Complete with instructions. Vintage Lego 6880 Space Surface Explorer Vehicle With Instructions. Condition is Used. Dispatched with Royal Mail 2nd Class. Complete LEGO Space set number 7647 MX-41 Switch Fighter. A couple of small stickers are missing. LEGO 70141. Legends of Chima Vardy's Ice Vulture Glider. Good Condition, All pieces looked to be there. LEGO Set # 6896-1: Celestial Forager - Vintage 1990. Condition is Used. Set is complete. Dispatched with Hermes only. LEGO STAR WARS SET NO 75093 DEATH STAR FINAL DUEL THIS SET IS 100% COMPLETE AND COMES WITH INSTRUCTIONS AND ALL THE MINI FIGURES AND IS IN GOOD USED CONDITION SELLING ALL MY SONS LEGO SETS OVER THE NEXT FEW WEEKS SO PLEASE TAKE A LOOK AT MY OTHER AUCTIONS Buyer collects. Sets: Star Wars Expanded Universe AS THE MAJORITY OF OUR LEGO IS PRE-OWNED, OUR LEGO GRADING SYSTEM IS THEY MAY HAVE SCRATCHES, TEETH MARKS, SLIGHT DISCOLORATION OR NOT BE AS SHINY AS THEY ONCE WERE, BUT UNLESS OTHERWISE STATED THEY WILL NOT BE BROKEN AND THE PIECES WILL STILL FIT TOGETHER. Lego is not suitable for children under 3. Clone Troopers vs. Droidekas. 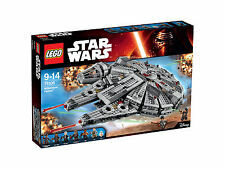 LEGO 75000. Lego Star Wars 7140 X-wing Fighter. COMPLETE SET W/ INSTRUCTIONS. 72 Dark White Bricks Plates Wedges Dishes, as shown. All pieces are in good condition with light signs of use. Sit the Clone Pilot in the cockpit ! Or position the wings in flight mode to survey the area for intruders ! The sleek V-wing fighter can adapt to any situation ! All our genuine Lego parts are in good used condition. LEGO Star Wars Jedi Defense I (7203). COMPLETE SET W/ INSTRUCTIONS.